A search for it on Google News brings up far more references to the actress Jessica Alba, and even some to the BBC's Scottish Gaelic-language television channel, BBC Alba. As a result, you may be surprised to learn that it held a summit this week in the Ecuadorean city of Guayaquil, at which its members pledged to form "a powerful economic zone". At the end of the meeting, the host president, Rafael Correa, denounced "neo-liberalism" and "neo-colonialism", declaring that free trade created zones of "hunger and poverty". Alba - the Bolivarian Alliance for the Peoples of Our America - was the brainchild of Hugo Chavez, Venezuela's late president. Apart from Venezuela and Ecuador, the meeting also brought together leaders and delegations from Bolivia, Cuba and Nicaragua. Four English-speaking Caribbean countries took part as well - Antigua and Barbuda, Dominica, St Vincent and the Grenadines, and the bloc's latest recruit, St Lucia. In essence, then, Alba consists of one oil-rich nation and various minnows wishing to benefit from its largesse. Not the most promising basis for a new economic superpower, you might think. And indeed, there is little chance of the rhetoric becoming reality any time soon. But thanks to Venezuela's influence in other spheres, its ambition has the power to hamper moves towards free trade in other powerful countries in the region, including Brazil, its biggest economy. After the death of Chavez in March, his anointed successor, Nicolas Maduro, inherited an economy beset by a series of problems: crumbling infrastructure, unsustainable public spending and underperforming industry. Many of Venezuela's neighbours feared that as a result they would no longer be able to enjoy cheap deals and soft loans within the Alba group and under the Petrocaribe programme. Under Mr Maduro's presidency, the difficulties have remained stark. Last year, the Venezuelan economy grew 5.6% on the back of a pre-election public spending boom. But survey organisation Consensus Economics forecasts that this will slow to just 0.7% GDP growth in 2013. Meanwhile, inflation in the 12 months to the end of May reached 33.7%, while shortages of basic goods remain widespread. All this would seem likely to curb Venezuela's ability to aid its allies. But as it now transpires, Mr Maduro wants to draw on the resources of other trade alliances to prop up his vision of an integrated left-wing economic bloc. In a news conference to close the summit, he said that Alba's aim was to join forces not only with Petrocaribe but also with the Caribbean common market, Caricom, and the South American trade alliance, Mercosur. He said this would produce "a common economic zone of shared development". Most Caricom nations are more likely to rally round the table as supplicants, not contributors. Twelve of Caricom's 15 members are already beneficiaries of Petrocaribe. As one commentator puts it, Petrocaribe "has kept member countries from falling off the global downturn precipice for some time". But there is disunity in the ranks. The Caribbean's strongest economy, Trinidad and Tobago, which has oil and gas reserves of its own, has so far resisted all overtures from Caracas. Mercosur, however, is a different case altogether. Founded in 1991 as a free-trade bloc, it originally had just four members: Brazil, Argentina, Uruguay and Paraguay. In July 2006, the four began the process of admitting Venezuela as a full member. But full ratification was held up for six years, because the Paraguayan Senate dragged its heels on approving the expansion. In fact, it still hasn't. What happened in the end was that Paraguay was suspended from Mercosur after the impeachment of its president, Fernando Lugo, a move deemed undemocratic by the other three founder members, which then seized the chance to admit Venezuela properly in July last year. Some opposition politicians in Brazil saw Venezuela as a Trojan horse in Mercosur, maintaining that Chavez's "21st-Century socialism" was incompatible with the alliance's free-trade stance. And so, arguably, it has proved. Brazilian businessmen are forever complaining that Mercosur is now an ideological bloc, not a trade pact - although some Brazilian companies are doing well out of infrastructure contracts in Venezuela. With Venezuela currently holding the rotating presidency of Mercosur and Paraguay still out in the cold, the balance of power has shifted against Brazil. In Argentina, President Cristina Fernandez de Kirchner has put up more and more trade barriers, while big Brazilian companies such as the mining multinational Vale have been halting prestige projects there. "Mercosur has been in crisis for some time," lamented an editorial last month in Rio de Janeiro's leading newspaper, O Globo. It said: "Founders such as Argentina are practising protectionism against Brazil, for example. There is a lack of integration and dynamism, which has got worse with the admission of Venezuela. "Who is going to want to do more trade with a bloc that welcomes a country with such a nominal democracy and which is hostile to the US, the biggest market in the world?" The problem for Brazil is that it is trapped in one dysfunctional trade bloc without being allowed to reach out to others. Under Mercosur rules, no member country is allowed to strike unilateral trade deals with outsiders. Talks on a Mercosur-EU free-trade pact, which could be a potential game changer, have been going on for years without success. 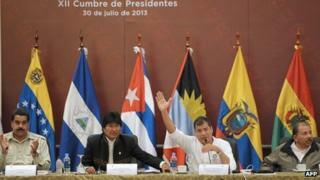 At the same time, Chile, Colombia, Mexico and Peru have set up their own rival trade bloc, the Pacific Alliance. Despite Mercosur's restrictions, Paraguay has successfully applied for observer status and Uruguay has said it wants to become a full member. Unfortunately, Brazil can ill afford to turn its back on free trade at this juncture. President Dilma Rousseff's popularity is in free fall after the nationwide protests that erupted in June, while growth is stagnating and inflation is on the rise. If Ms Rousseff does not find a way out of the trade impasse before the presidential election next year, the voters' verdict could be harsh.